I am in full Fall mode! I usually don’t decorate, but I got a few items for like, 90% off at Hobby Lobby last year that motivated me. 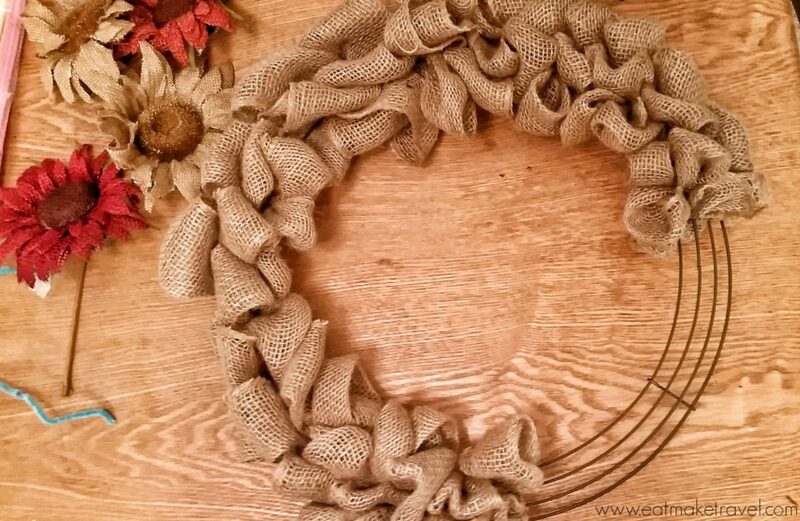 One thing that I must have wanted to make last year that I totally forgot about is a Burlap wreath. I found some of the supplies in my Fall stash. I needed only a couple more items to complete the look that I was brewing in my head, so I set out to Hobby Lobby to fulfill my vision. 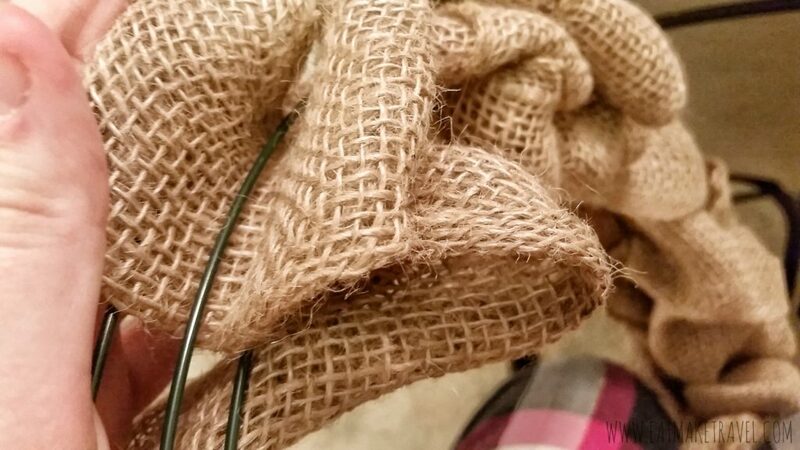 I used 2 rolls of 5 inch burlap that were about 10-15 feet long, I think my next wreath I will buy 3 so that it can be more fluffy, but I am happy with this one. 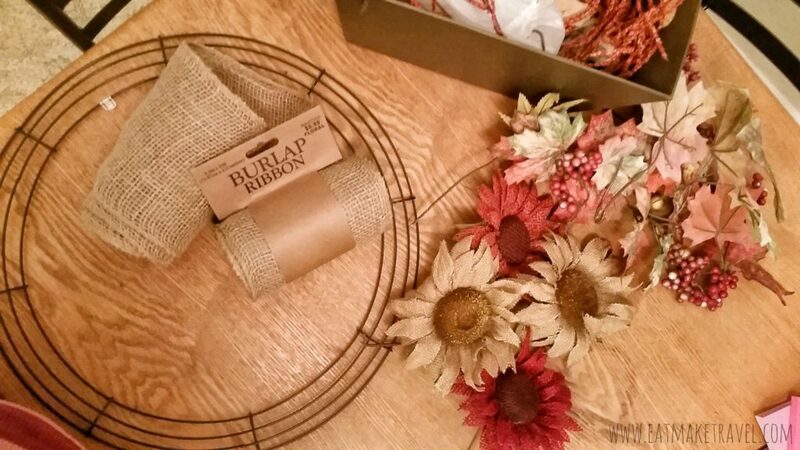 If you are using burlap, I suggest at least 3 rolls of burlap, or a smaller wreath ring. I got mine at Hobby Lobby for under 3 bucks (forgot my phone so couldn’t use the 40% coupon). But someone told me that you can purchase them at the Dollar Tree, so you may want to check there. 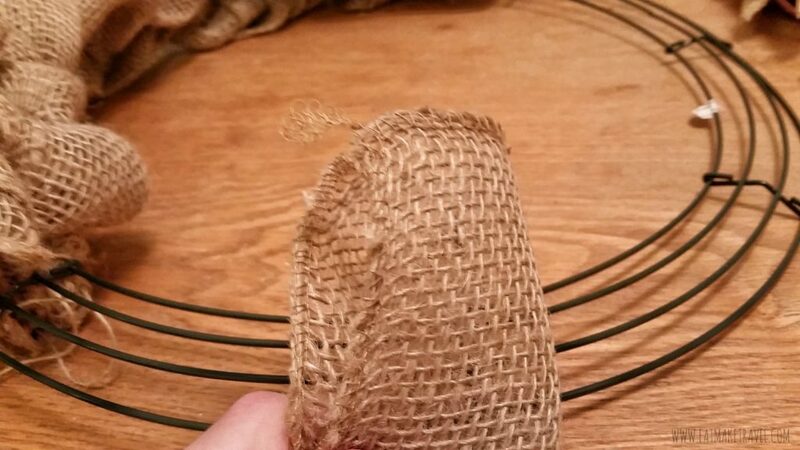 You want to fold the burlap (width) and put it around the most inner piece of the ring, you may want to get a piece of wire or thread to tie it to the ring to keep it in place. You probably want about 2 inches of material thru each ring, with about 3 total in each section or until it fits to where it won’t come out on its own. You can see how they are broken up on the ring, that is what I mean but sections. 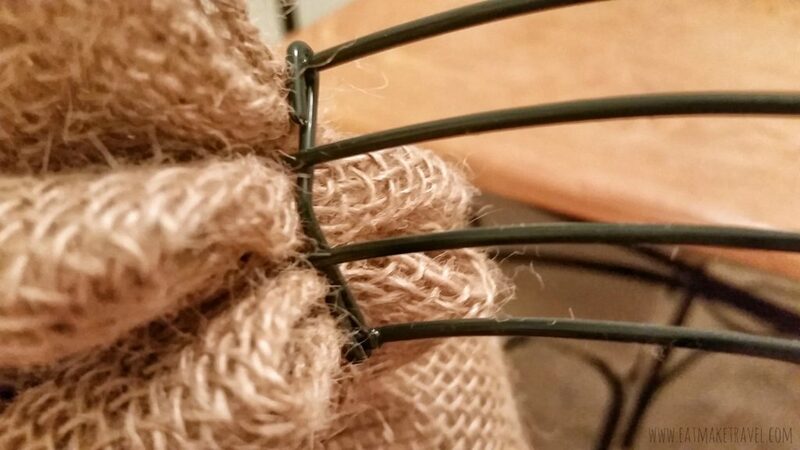 If you feel like just isn’t holding together on its own, you can always bunch a section together and tie off with a pipe cleaner (on the back, of course). I left a section bare so that I could add the flowers and leaves that I wanted to add. 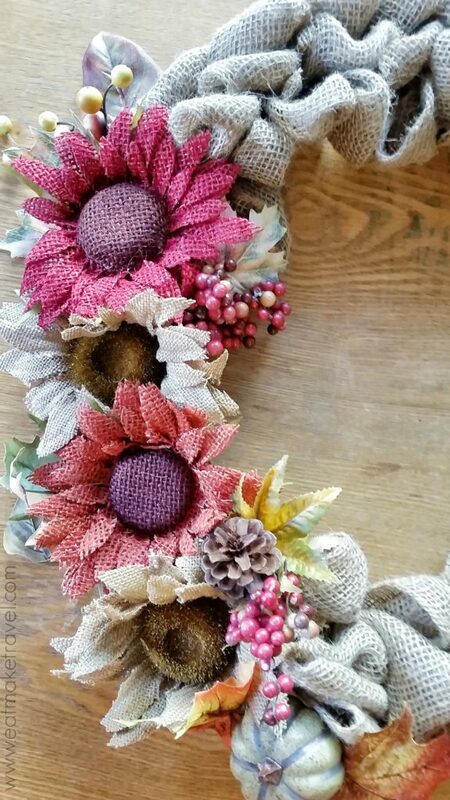 I got the sunflowers from Hobby lobby and the rest was from an old wreath that I had disassembled a few years ago. I just played around with it until they were in a position that I liked. That’s the beauty of something that you make yourself; you can make it however you want it. 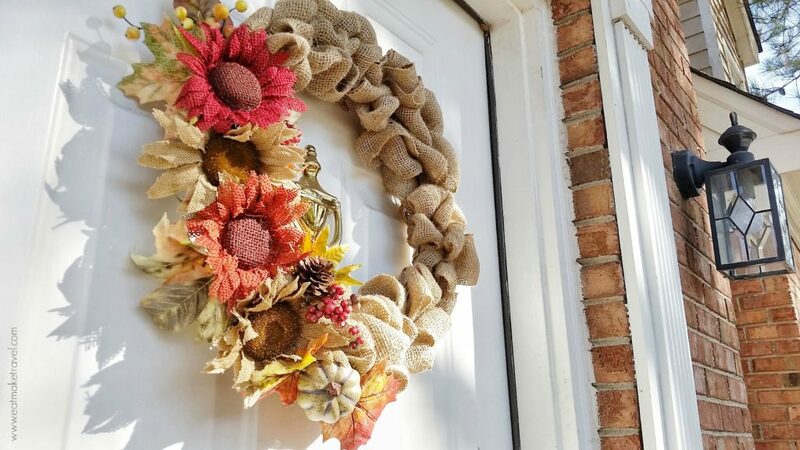 It looks great on my door, all I need is some flowers in my flower-pot to make my front complete for Fall. Get a weekly update straight to your inbox on travel, food, diy and what's going on in Atlanta!